Cosworth High RPM Valve Springs are the result of countless hours of engineering, testing and validation ensuring the best possible spring for high performance applications. 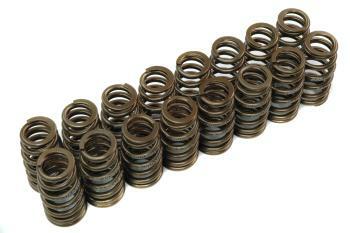 Cosworth High RPM Valve Springs are wound from the world’s finest Japanese Kobe steel and feature dual chamfered ends to reduce wear on seats and retainers. Each spring has been engineered with increased seat pressure along with higher lift capability for optimum performance potential and improved valve control. Single spring design allows easy installation with no machining required and is perfect for typical high performance use.